All prices in this brochure are based on airfares, land rates and exchange rates in effect at the time of printing and on group rates of 30 passengers or more. Tours may depart with less than the required number of passengers, at the discretion of Tenerife, but an additional charge may apply. Passengers will be advised about such surcharges 60 days before departure. All prices are subject to change without notice prior to departure due to major currency fluctuations, changes in fuel prices and/or unforeseen economic circumstances. Please complete the Participant Agreement, with full names as they appear on passports, and mail it to us with the required per person deposit plus applicable (optional) insurance. Receipt of your deposit shall act as your agreement to these terms and conditions. Balance is due 60 days before departure date. If final payment is received less than 60 days, a late fee will be accessed in the amount of $50.00. If final payment is made by credit card (American Express, Visa, MasterCard), Tenerife requires a completed credit card authorization form. All payments made by check should be made payable to Tenerife. If a booking is made within 60 days of departure, full payment plus applicable taxes and optional insurance is due at the time of booking. There will be a $50.00 late processing fee applicable plus cost of any express or overnight mail services. No personal checks will be accepted with reservations received 30 days or less before departure date. Money order, bank check, certified check or credit cards (American Express, Visa, MasterCard) will be accepted. A valid passport (valid for six months after the return date of the trip) is required to travel. Visa is required for US passport holders traveling to some destinations; please contact our office for details. All non-US citizens must contact the appropriate consular office for entry visa requirements pertaining to their trip. In addition non US citizens are responsible for complying with requirements for re-entry into the USA. Tenerife assumes no responsibility for procurement of passport or visas. Obtaining and carrying these documents is the sole responsibility of passengers. Tenerife will not be responsible for any delays, damages and/or losses, including missed portions of your trip due to improper travel documentation. All documents and tickets are only issued upon receipt of final payment and are sent within 3 weeks of departure. Documents and tickets are not guaranteed if final payment and booking form are not received on time. All brochure departure are based on a New York area airport. Tenerife can help arrange air transportation from your home city airport. Tenerife is not responsible for any penalties incurred on domestic tickets not purchased from us, in case of changes in the schedule of the tour. If you are making your own domestic airline tickets, please make sure that your domestic flight time arrives at least 4 hours prior to your international departure time. Airline tickets issued by Tenerife are highly restrictive and in most instances cannot be reissued, revalidated or exchanged. If a change is possible, a $75 per person administrative fee, plus any applicable airline change fees, will be assessed once air tickets have been issued. Airline penalties vary depending on carrier. There is no advance seat selection. Early check-in is necessary to secure seats with travel companions. Seating is solely under control of the airlines. Some airfares used may be eligible for frequent flyer mileage. We recommend that you take along one suitcase per person with a maximum weight of 50lbs., plus one carry on with maximum dimensions of 9"X14"X22". Airlines also have their own baggage restrictions; please check with the air carrier prior to your departure. All baggage is the passenger's responsibility throughout the tour. Tenerife is not responsible for loss, theft or damage to your baggage. If a bag is lost or damaged In-flight, the passenger is responsible for notifying the airline directly. The airlines concerned will not to be held responsible for any act, omission, or event during the time passengers are not aboard their aircraft. The passenger tickets in use by the airline, when issued, shall constitute the sole contract between airline and the purchaser of these tickets and/or passenger. These tours may be sold in connection with the services of any ATC or IATA Airline. Prices shown in the brochure are per person, based on two persons sharing a hotel room or cabin. A limited number of single rooms are available at the supplement shown for each tour. In some cases, when requested, we may be able to find an appropriate roommate for passengers who have booked as a single person. If a roommate is not available, you must pay the single room supplement. While single rooms provide privacy they are often smaller than twin bedrooms. Triple rooms are available in many hotels for family or friends traveling together. There are no discounts for triple rooms. While we endeavor to provide the highest level of service to all our passengers, we cannot guarantee special facilities or assistance for disabled passengers and it is your responsibility to arrange for such assistance as required. We regret that we cannot provide individual assistance Tenerife is not responsible for any medical conditions that may occur prior, during, or after the tour. 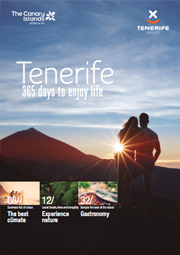 All Tenerife packages include airfare from the city designated. Land only bookings will be invoiced based on adjusted price. Arrival and departure transfers are not provided for land only bookings. Any deviations from the tour, requested by the client, will be assessed a charge of $100.00 per person, plus any additional costs the change may incur. The tour member understands that he or she has no claim against Tenerife, and its affiliates, for any delay or damage to or loss of property or baggage or injury to or death of persons due to any neglect or willful act of a direct air carrier, hotel, bus company, steamship or cruise company, railroad, transportation company or service company of any kind, or any other person or persons rendering any of the services being offered in connections with these tours. Further, Tenerife advises that it has no ownership interest whatsoever in any hotel, restaurant, bus company or transportation or service company of any kind outside the USA, nor does it have any employee outside of the USA. You may see the name Tenerife affixed to motor vehicles, on signs around the hotel or elsewhere. This use of our name is purely for reasons of identification and does not denote ownership, supervision, or control by Tenerife in any way. Tenerife, a brand of Group IST, LLC, and its overseas representatives reserve the right without notice to change, amend or cancel any part or all of the tour and to make such changes as may be necessary. Tenerife acts only as an agent in securing hotels, transportation and other travel services from suppliers, and in no event shall Tenerife be liable in the event of any failure by any person or company to render any transportation, lodging or other travel services to be provided on the tour. The acceptance of the initial service to be provided under the tour shall be considered an acceptance by the tour member of these conditions. If there is a difference between the conditions of Tenerife and those published by suppliers, the conditions of suppliers shall apply. Tenerife reserves the right to substitute hotel, cruise ships and air carriers of similar quality, and reserves the right to vary the sequence of sightseeing and/ or to re-route the order of cities. In calculating the cost of the trip, Tenerife has relied on your consent to these terms and in the absence of this release, the cost of the trip would be higher. A contract is made when your reservation and payment are accepted by Tenerife and any dispute shall be governed by New York law. We reserve the right to decline to accept a person, or remove a person form a tour, if such person presents a significant risk to the health or safety of himself or the group and the person cannot otherwise be reasonably accommodated. We hope that nothing will prevent you from taking your Tenerife pilgrimage. However, should you need to cancel, your cancellation must be received in writing, via email, fax or by letter. It will be effective on the date of receipt. If you cancel your tour after you have received your documents and airline tickets, you must return them to Tenerife before we can process your refund. The following cancellations fees are only for fixed departure date tours published in our brochure. Fees for custom groups and tours may be different, please contact us for details. We reserve the right to cancel a specific departure date or whole tour due to lack of participation or for reasons beyond our control such as natural disasters, acts of war, acts of God or government restrictions. If such an unlikely event should occur, we will offer an alternate departure date or tour program. Should you decline an alternate date or should we cancel the tour outright, the limit of our liability to you will be the refund of all monies received, including any cancellation penalties. We will not be liable, however, for costs incurred by you not paid to us, such as visas and passport costs, items of a personal nature, domestic transportation either by ground or air etc. nor will we be liable for any psychological damages, traumas, stress, disappointment, personal and financial loss resulting from our change of departure date or cancellation of a tour. Refunds are not provided for services included, but not used on a trip. Airport taxes, border taxes, port taxes, and items not listed on each program such as meals, beverages and items of personal nature, excess luggage allowance, laundry, room service, travel insurance, passport and visas costs, shore excursions, expenses for additional sightseeing not specified in the itinerary, any incurred medical costs and replacement of items forgotten or stolen while on the tour, and gratuities (a list of suggested tips will be provided with final documents). Tenerife is not responsible for any typographic or printer's error or omission. Prices in this brochure and on our websites are accurate at the time of printing and are subject to change without notice due to changes in market factors including but not limited to foreign currency and supplier cost fluctuations. Tenerife, a brand of Group IST, LLC is a registered seller of travel in the State of California, CST# 2077183. For security reasons and due to the measures taken by the authorities, airlines require that the passenger's name in the air reservations must exactly match the name as it appears on the passport. Tenerife is not responsible for denied boarding or re-issue costs due to an incorrect name supplied to us. Tenerife requests a copy of your passport picture page to ensure correct name on tickets and documents.